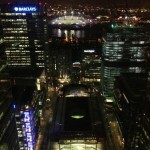 In March I had the chance to join a hackathon at Level39, Canary Wharf in London. My friend and I have been invited by Simon Redfern of the OpenBankProject. They already had participated in the FinTech Innovation Lab program there….